Window cleaning Sunshine Coast. Whether it’s your home or business, keeping your windows crystal clear is a basic measure to improve the overall appearance of the building and let natural light inside unobstructed. Aqua Fresh has been providing quality window cleaning Sunshine Coast solutions on the Sunshine Coast for years with a focus on customer care and first-class results. Aqua Fresh Cleaning team of staff and service technicians are highly experienced in various window cleaning techniques including traditional window cleaning methods. Using state of the art window cleaning tools and supplies, our professional service team are skilled at leaving your windows with the results you expect from professional window cleaners. Ladders are safely positioned when accessing windows to a limited height. 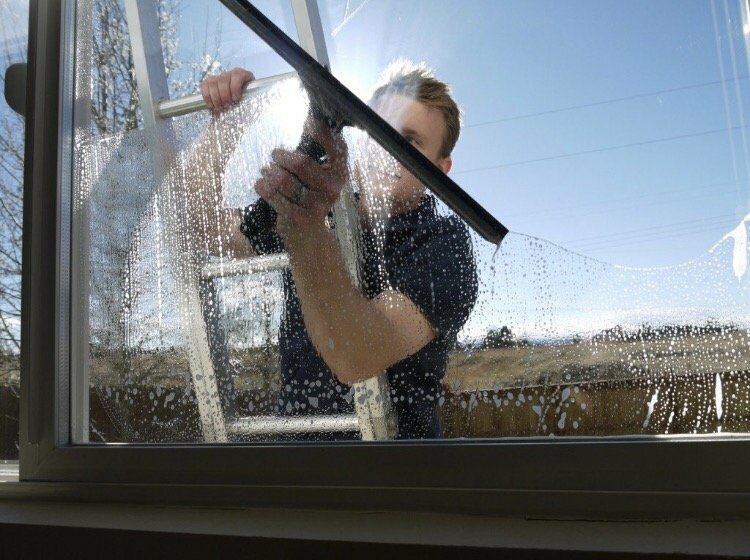 Using traditional tools of the trade and experienced staff, our window cleaning services are completed with the upmost attention and care for your windows and your property. 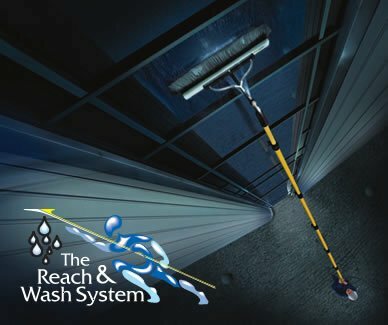 pure-water-tech Pure Water Technology window cleaning uses 100% pure water which is pumped through a telescopic pole with an attached brush head. Our window cleaners expertly utilise the telescopic pole to effectively clean windows up to 6 floors in height or any difficult to access windows. These may include windows located above obstructions such as vehicles, flower beds or delicate landscaping. 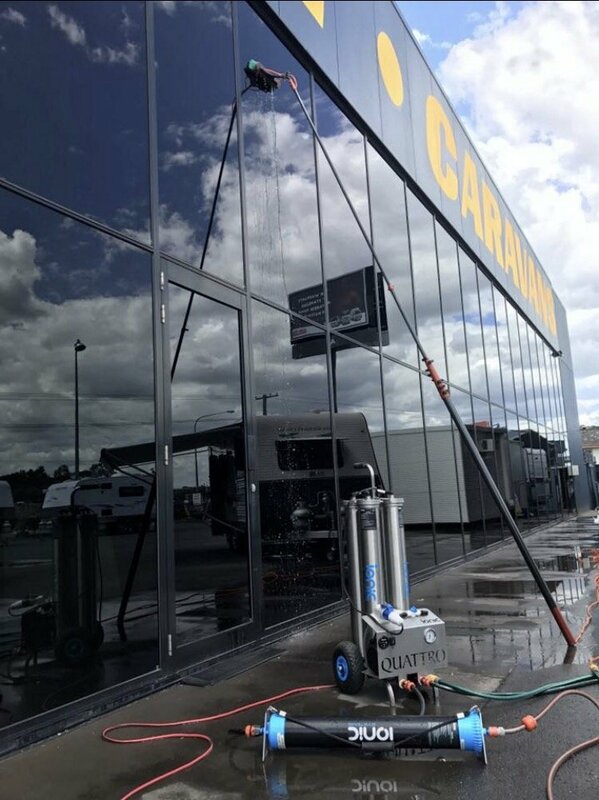 Another important benefit of using this advanced system in window cleaning is its advantage of providing a more environmentally friendly window cleaning method, as no chemicals are used. Aqua Fresh Cleaning specialises in all aspects of window cleaning by using the very latest in water purification and water pole window cleaning systems. We are highly trained and experienced in the safe use of ladders, harnesses and EWP’s (cherry pickers) which means we can access any building in a safe and controlled manner. Aqua Fresh Cleaning currently services all types of premises including Business, Commercial Buildings, Shops, Schools, Hotels and Nursing Homes. Our staff are friendly, prompt and professional at all times. Aqua Fresh Cleaning are able to access and tackle any task, with ease, in a safe and controlled manner, with no height limitations. To experience the best window cleaners Sunshine Coast & window cleaners Sunshine Coast has to offer, get in touch with Aqua Fresh on 0434 126 852. Alternatively, send us your details and we’ll be happy to provide you with more information. Window cleaning Sunshine Coast.